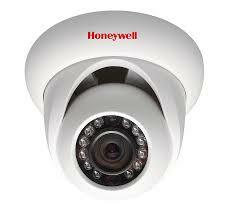 Honeywell Performance Series NVR and IP camera bundle offers a high-quality and cost-effective surveillance solution. The bundle includes a 4-channel 1080P NVR and 4 full HD 1080P IP cameras with IP66 weather-proof construction. With compact designs and various user-friendly features, this full HD bundle is ideal for both indoor and outdoor medium-scale applications in retail stores, residential, education facilities, warehouses and so forth. The NVR supports 4-channel real-time recording at 1080P for high definition image storage. It also supports live view, streaming relay and playback, and is embedded with 2 internal HDDs with maximum 8TB storage. Apart from internal storage, videos and snapshots can be saved in ftp sites, USB memory drive or client PC via the internet. With 1080P HDMI output and VGA output, the NVR is ideal for high quality monitoring operations. Certain alarm settings can be configured with the NVR, including motion detection, camera tampering detection (alarm alerts with automatic emails and video or snapshots),and automatic alerts (buzzers or flashes) . Installations are quick and easy with the user-friendly Setup Wizard and PoE ports for camera plug-and-play. Remote configurations of cameras, NVR, network, as well as firmware upgrade can be done via the Honeywell Viewer web client and the Honeywell configuration tool. The intercom function also helps communications between operators in different sites. Use the feature-rich HonView Touch mobile app for iPhone®, iPad® Android™ devices and laptops to monitor the surveillance areas from anywhere with WI-FI access. Moreover, network monitoring such as transmission of alarm information can be done via the SNMP protocol. Quality remains with mobile access that, all channels support simultaneous live view and playback at 1080P at full frame rate. Up to 50 NVRs can be interfaced and administered simultaneously with HDCS, the Honeywell central management software. Operators can easily perform recording, live viewing, playback, configuration, video switch, and so forth. Each bundle set is packaged with 4 full HD 1080P IR dome or bullet cameras. At low illumination or complete darkness, the cameras use its built-in IR LEDs to provide useable black and white video with up to 20m (dome cameras) IR beam distance. Also with H.264 compression, True Day/ Night, 3D Noise Reduction, privacy masking and motion detection, and IP66 housing, the cameras are suitable for installations in both outdoor and indoor environments. High quality, feature-rich and easy-to-operate, the Performance Series NVR and IP camera bundle is designed for medium-scale installations at an affordable price. Also with various remote access tools, this bundle is ideal for retail stores, residential areas, clinics, offices, commercial buildings and so on.